Sometimes I finish reading a book and I swear it’s like I’m shell shocked. I’m dazed, I don’t want to talk to anyone, I don’t really want to listen to anyone. I feel like I’m stuck in some sort of limbo that only happens after certain stories. The thing is, it’s not always the story that leaves me shell shocked, but that the story is over. 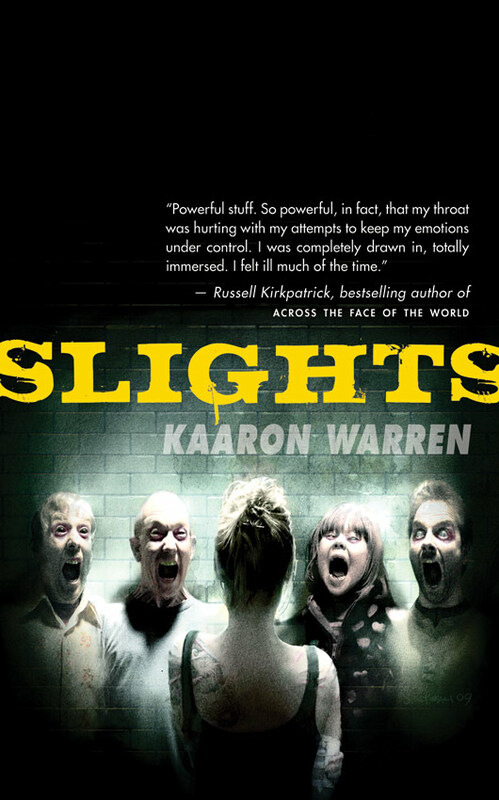 I’ve just finished Slights by Kaaron Warren after two days of gobbling that story up like a starved kid in a fast food restaurant whose body is craving fat to get it’s strength back and I’m a bit shell shocked. Not because of the story, but because it went so fast and my absorption was close to being unrivalled (I don’t have an addictive personality, I have an absorbing personality). Slights wasn’t what I was expecting. It was meant to be disturbing and I’m starting to think that perhaps when people tell me it’s disturbing or critics say it’s disturbing I shouldn’t take their word for it. Their view of disturbing is pretty tame compared to my view of disturbing. I must have a pretty warped imagination or just desensitised to otherwise disturbing scenarios because I’ve been waiting for it and it never came. The story was over and I never saw disturbing. I guess it’s no Georges Bataille (The Story of The Eye was disturbing in another way. He tried too hard to be offensive and his effort was… uncomfortable), but I still feel that for a lot of people it could freak them out. It’s the first novel by Kaaron Warren and I want to say it’s well written, but I can’t. I also can’t say it’s badly written because it isn’t. It’s not written by common grammatical or structural standards and I think that might be one reason why I liked it so much. Her way of writing is similar to that stereotypical view that when women start talking they ramble on for hours without any actual path (which is bull because I’ve experienced men do that too). It’s got that rambling way about it, but at the same time there is a structure. You can see a plot unravelling and in the process you get to learn a lot about the main character, her past, the characters around her, and her obsession. For some it might actually be disturbing, but for me it wasn’t at all. When there is a label on a novel that says it is disturbing (and I quote – “one of the most disturbing novels of 2009”) and horror then I expect as much, but unfortunately I was disappointed on that count. It’s ok though because I usually am so I’m not going to hold it against the story or the writer. The story actually deals with a lot of death, and hints at some pretty obscene and horrific acts, and yet in all that darkness I found quite a sense of humour. I don’t usually laugh when I’m reading. I’ll smile, maybe, but not laugh and I did with this one. I think the character Stevie is great and hilarious even though she is so crude. I even had to write down some of the lines because they entertained me so much. It was a really enjoyable, entertaining book (500 pages in a day and a half which is pretty good for me), and I really wish my friends were into that this sort of subject so they could read it and talk to me about it. I’m really glad this was written by an Aussie author and I’m looking forward to reading her next novel. Wow – this sounds full-on (note I didn’t say disturbing 🙂 ). I absolutely know what you mean by being shell-shocked after emerging from an absorbing read – love that! It was full on! One of two of the best books I’ve read so far this year.